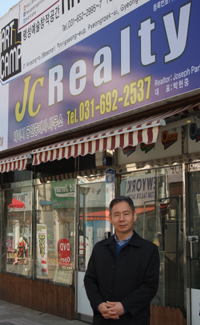 President & CEO Joseph Park stands in front of his office "JC Realty" in S. Korea's Pyeongtaek area. Once dubbed "Hermit Kingdom" for shunning foreigners, South Korea has now over 1.5 million foreign residents, whose number account for nearly 3 percent of its total population. With this in mind a former church preacher decided to dedicate his life to the needs of foreign residents seeking apartments and offices after he spend scores of years studying and living in the United States. Mr. Joseph Park (Korean name: Park Hyun-Joong) recently moved to Gyeonggi Province's Pyeongtaek area south of Soeul to serve the various needs of US soldiers and other foreigners in the area by opening a real estate office. 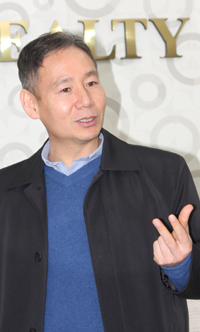 He said that Camp Humphreys based in Pyeontaek will be the single largest US military located overseas by the influx of the US military personnel and large foreign populations. President & CEO Joseph Park is interviewed by The Seoul Times at his office "JC Realty" in S. Korea's Pyeongtaek area. 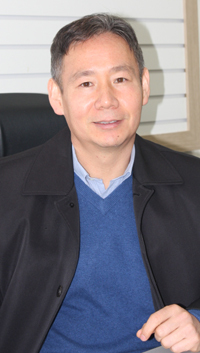 In a recent interview The Seoul Times met with Mr. Park at his newly opened office in Pyeongtaek's Anjeongri area right in front of the US military installation to find out how the influx of foreign populations would change the life and geography of the area and how plans to serve the foreigners. Here are the questions and answers of the interview with the realtor. Q1: First of all we thank you very much for your interview. You have recently opened your real estate office in Pyeongtaek area. Why did you choose this area and how will you make your office different from other real estate agencies? A1: Pyeongtaek is the area where US military is planned to be relocated from Yongsan and other areas of South Korea. I came to Pyeongtaek because this area will be developed by leaps and bounds in the future. 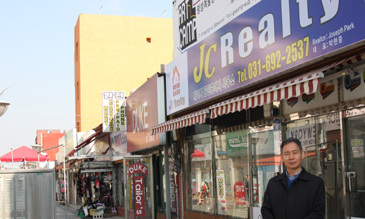 There are some 20 real estate agencies in this Anjeongri area of Pyeongtaek. Unlike others I want to make ours very friendly to foreign clients particularly US military personnel, US civilian employees working in the US Army, and their dependents. For that I use half of my office space for art gallery so that our customers feel better and more comfortable. I now interact with artists and cultural organizations in the area. Through the gallery space in my office I want to introduce Korean culture to our foreign customers as well as serving their needs for real estate. 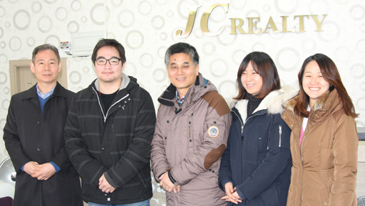 President & CEO Joseph Park (left) poses with his co-workers and members of Gyeonggi Cultural Foundation at his office "JC Realty" in S. Korea's Pyeongtaek area. Q2: Can you introduce your co-workers in the office? Are they able to speak English? How will you and your employees serve foreigners? There are three full time workers in my office including myself. They are all flawless speakers of English and they understand American culture well. As for me I spent 22 years in the US, studying a graduate course in counselling at Southwestern Baptist Theological Seminary at Fort Worth in Texas. I worked for seven years as an interpreter at a Korean church there. I was also involved in teaching middle school students. One of my employees, Mr. Joseph Choi, studied at Saint Mark's High School and at New York University. The other one is Ms. Davis who has 30 years of experience in dealing with foreigners. Three of us, all studied and lived in America, will serve various needs of Americans and other foreigners in the field of real estate business. President & CEO Joseph Park Interviewed by The Seoul Times at his office "JC Realty" in S. Korea's Pyeongtaek area. Q3: What kind of real estate service are you offering now? What other services do you plan to offer to your customers in the future? A3: We are now focused on arranging houses and offices for our tenants. But we will soon expand our business to other parts of brokerage business including land development and apartment sales. Q4: We heard that you will do your real estate service in cooperation with the Gyeonggi Cultural Foundation for various cultural programs. What about collaboration with the US Army in Pyeongtaek? A4: We are located just at the entrance of the US Army base, Camp Humphreys, and we decided to use our office space for cultural exhibition galley in cooperation with the US Army. Luckily the Gyeonggi Cultural Foundation agreed to offer a variety of cultural programs at our office as well. Now we are introducing various cultural programs happening in our area through a big wide screen TV set up in our office. Pedestrians can watch it on the street. In addition we are planning to open a small theater within the coming summer for the American soldiers and the Korean neighbors. Q5: What do you think are the problems or difficulties facing foreigners in their search for houses and offices? What are the possible solutions for these problems? 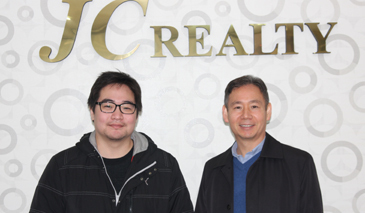 President & CEO Joseph Park (right) poses with one of his co-workers Mr. Joseph Choi at his office "JC Realty" in S. Korea's Pyeongtaek area. A5: Unlike Seoul's Yongsan area Pyeongtaek is not the area where American soldiers can choose what they want easily due mainly to the lack of properties including houses and offices. There will be more demand for supplies in the future as more and more US military units in the nation are scheduled to move to Pyeongtaek area. The main difficulty for our foreign customers is the language barrier when they look for houses and offices. Fortunately all of our staff including myself are excellent speaker of English. So we are sure that we can be quite convenient and capable agent between the foreigner customers and the local landlords. One more important thing is the difference between America and local Korean cultures. We always keep this in our minds. For this reasons we are sure that we can contribute a lot to the lives of the American soldiers. Q6: We heard that you lived in America for many years. Could you compare the real estate culture and system of Korea with those of America? What are the differences? A6: First the ambience of the real estate offices in America is quite different from that of Korean ones. In the US large and space offices can earn the trust of customers and the visitors can feel comfortable at their "c "cafe-like" interior design. Most real estate agencies in Pyeongtaek area are small and their interior design is not up to the level of American ones. In America most real estate agencies not only mediate for renting and selling the properties but also they do the management service for them. Now, some Korean agencies began to do the management service just like America. Q7: It is quite unusual that you spent most of your career in America and returned to Korea to take exam to become a licensed real estate agent. When and on what occasion did you decide to become a realtor? A7: A few year ago when I was offered a position as a principal of a foreign high school in South Korea I was agonizing over the terms and conditions of the position. I was planning to go back to my family in the US back then. I came to realize that I can get a job as a realtor dealing with foreign clients particularly for US military personnel. I decided to get the license. And I heard that most US military and its bases in Seoul and its vicinities plan to relocate to Pyeongtaek area. That was the moment for me to open my office in this area. Q8: ROK-US Combined Forces Command in Yongsan and the 2nd Infantry Division in Dongdocheon will complete their relocation to Pyeongtaek by the end of 2016, making Camp Humphreys the largest US military base in the world, if we are not mistaken. How would the influx of the US military personnel and their dependents change the city of Pyeongtaek? A8: Pyeongtaek will have a population of 1 million by the year 2020 and the population of Pyeongtaek's Anjeonri, where Camp Humphreys is located, will increase to close to 200,000 from the current 30,000. This is the area where we can create "blue oceans." In particular Samsung and other business conglomerates is planning to develop large-scale industrial complexes in nearby areas. Q9: Let us give you a personal question. What did you do before you became involved in the real estate business? Cand you introduce your life in America? A9: I went to American for advance degree in 1990. I ran a small business "JOY Communication from 2000 till 2010. I also worked as a counsellor and a preacher at the Korean church I attended. As a father of four children I had to start my own business to become a successful breadwinner. Q10: We heard that you are a devoted Christian. Could you introduce to our readers the church you attend in Pyeongtaek area? A10: Located in nearby Songtan God's Global Grace Church is full of foreigners not only American soldiers and their dependents but also other foreigners including Filipinos, Indians, Europeans. Under the leadership of an American pastor who retired from the military our church is steadily developing in many ways. Our pastor is very good at interacting with local Koreans as well. It is one of the the most famous church in Pyeongtaek and its surrounding area. Q11: How do you spend your leasure or pass time? What do your friends say about your? What sports do you enjoy? A11: People says I listen to them very well. And I believe that it is my duty to listen to my customers for various needs in brokerage business. I enjoy playing golf. I was the winner twice at the amateur golf championships when I was in America.